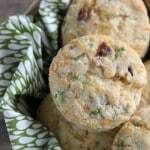 Foolproof Flaky Biscuits (+ Video) - Dessert Now, Dinner Later! The secret to Foolproof Flaky Biscuits is revealed! 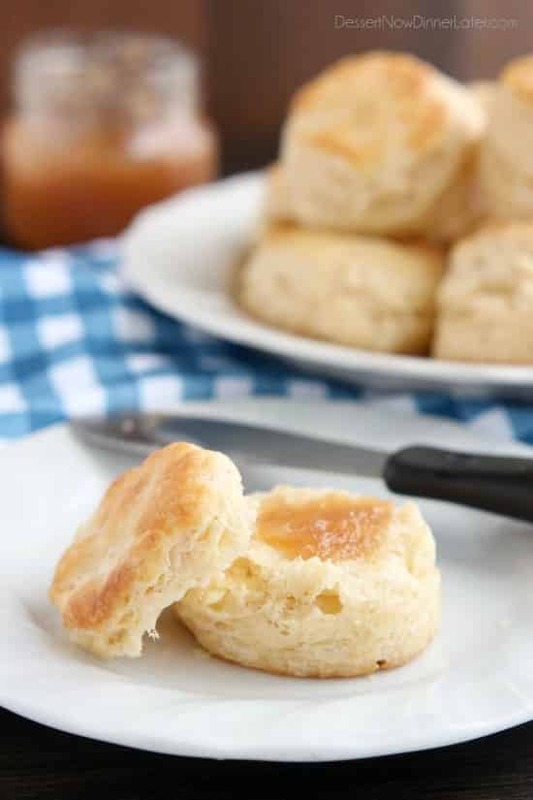 Find out how to get flaky, layered, buttery, tender biscuits you will swoon over! One of my husband’s favorite breakfasts is biscuits and gravy. I don’t make it very often because I haven’t had the best luck and getting a tall, flaky biscuit worth making again and again. I have since learned the secret to flaky biscuits doesn’t necessarily lie in the recipe alone, but that the technique also helps get you those amazing, buttery layers! It really is foolproof! I’m talking crisp exterior, peel apart layers, and a tender center! Did I mention these are oh so buttery?! Swoon! 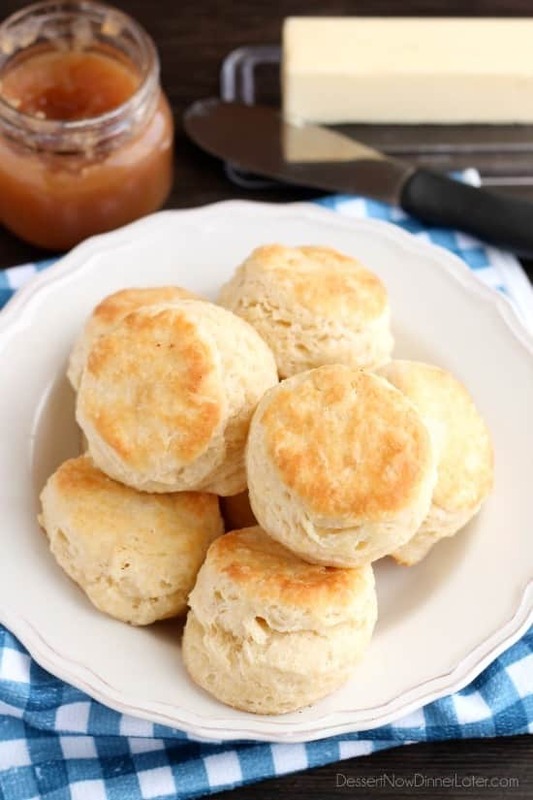 Slather on some apple butter, jelly or jam, butter and honey, whatever your pleasure, and enjoy these biscuits ASAP! Let me show you how to get the foolproof flaky layers… First off, it’s really important to have COLD butter when you make biscuits (or pie crust) because when the butter melts, it creates pockets of air to help make those flaky layers. Also, don’t crumble them all away. Pea size butter pieces are ideal. After you add the buttermilk and the dough comes together, roll it out into roughly a 6×9-inch rectangle on a lightly floured surface. Then cut that rectangle into thirds. Here’s the trick! Stack each third on top of one another and roll the dough into a 6×9-inch rectangle again. This helps ensure you get those tall, flaky layers! Using a 2 1/4 or 2 1/2-inch biscuit cutter, cut 9 (maybe 10) biscuits and place them on a silicone lined baking sheet. Do your best to piece together the scraps and use up all the dough with the layering technique, without overworking the dough or melting the butter with your warm hands. If any of the edges kind of stick down, I stretch them before baking to help make sure they will grow tall and flaky. You can see in the picture below that they are pretty thick to start with, about 1 1/4 to 1 1/2-inches tall, and you can see some chunks of butter and layering before they even go in the oven. Bake at 450 degrees Fahrenheit for 10 to 12 minutes or until golden brown on top and bottom. These are best enjoyed warm and crisp from the oven, but you can store leftovers in a zip-top bag for 3 or 4 days. I like to re-heat my leftover biscuits, one at a time, in the microwave for 10 to 12 seconds. 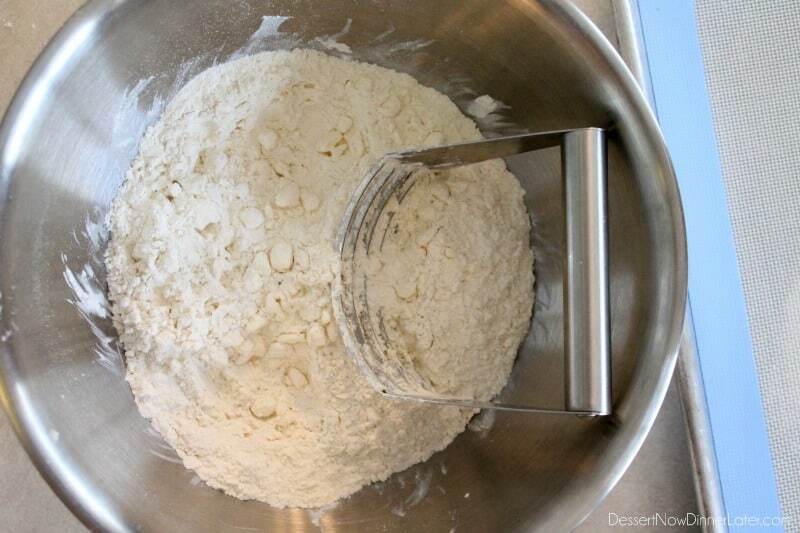 In a large bowl, mix the flour, sugar, baking powder, and salt. Cut in the butter with a pastry blender until pea size pieces. Add the cold buttermilk all at once and form into a ball. 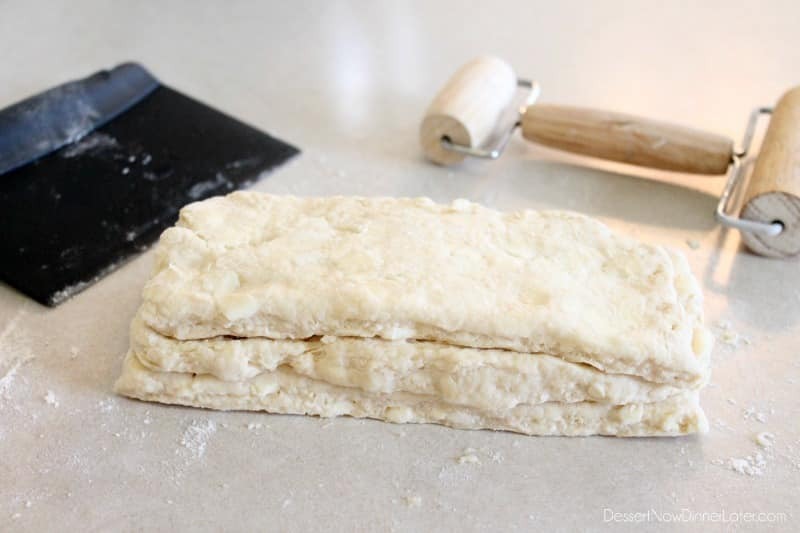 Roll dough onto a lightly floured surface, into a 6x9-inch rectangle. Cut the rectangle into thirds. Stack each third on top of one another and roll the dough into a 6×9-inch rectangle again. Bake at 450 degrees Fahrenheit for 10 to 12 minutes or until golden brown on top and bottom. Store any leftovers in a zip-top bag for 3 or 4 days. I like to re-heat my leftover biscuits, one at a time, in the microwave for 10 to 12 seconds. I’ve never heard of stacking the layers – but it sounds like the perfect solution! Definitely giving this a try! Yeah, it’s kind of a cheater method, but totally works! Amber, these look great, can you freeze them and bake them the next day(for Thanksgiving)? If you freeze them before you bake them, I’m sure they would be just fine. They may take 5 minutes longer to bake when you put them in the oven straight from the freezer. Just keep an eye on them. Let me know how they turn out! Ok so I’m trying this now and the stacking great I didn’t use lemon juice because I don’t have any so oven warming up I let you know how they turn out. Well they are a step up from drop biscuits that I haven’t made in 10 to 15 years. So first time Baker starting over they are great I prayed and thanked God they would come out good and they did. Thank you so much for ur knowledge. I’m so glad it worked out for you Juliet! You can substitute white distilled vinegar for the lemon juice if you want to in the future. It just adds a bit of tanginess that you would get with buttermilk. These are the best flaky biscuits I have ever made. Every one should try it! I just love all your biscuit tips, Amber! These really do look like the perfect flaky, buttery biscuit and I’m drooling over all that golden flaky goodness! Can’t wait to try these! i am going to try this recipethis week. Do you have a recipe for a good gravy to go with these? Thank you. Fantastic! Thanks for the stacking tip! Can’t wait to try it. I found a really great way to get the perfect texture for the butter is to freeze the butter and then use a a large box grater to shred the frozen butter. You’re welcome! I hope you get the chance to try it! Thanks for sharing your tips! I love the stacking tip in this post! 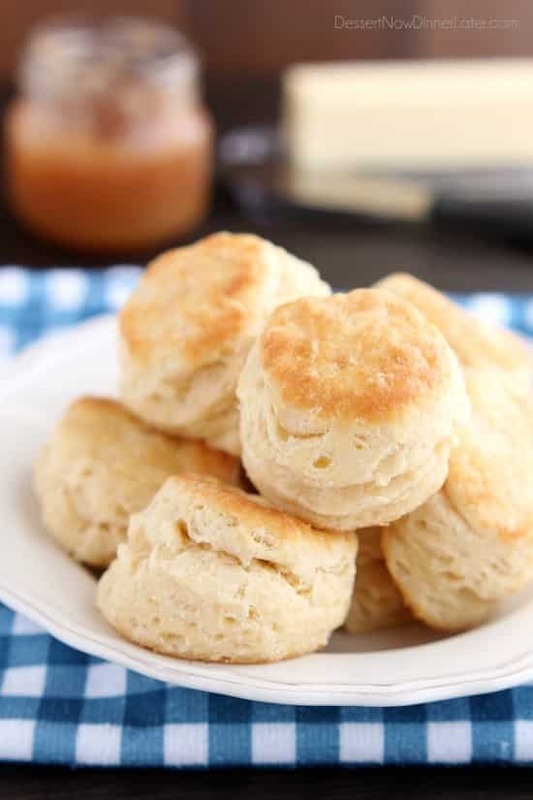 I love homemade biscuits and definitely need to give that a try. These look so delicious, Amber! Great idea about grating the frozen butter! 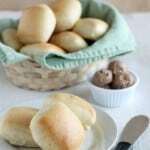 I just made this recipe and can’t wait to try them after bthey bake! Biscuits (or carbs rather) are my downfall! Butter and bread = LOVE! Thanks Kelly! Another method Iv used instead of cutting the dough and stacking is to roll out then fold into thirds, then roll again and fold into thirds. This technique made very flaky biscuits.!!! I do it that way. Makes a difference. Also I rub the butter into the flour between my fingers making flat pieces of butter instead of the more rounded pieces that you get with a pastry blender. Eager to try this! I can bake ANYTHING – except a decent biscuit. :)) Thanks. Well, this should work every time! I hope you like it! Great recipe! Thanks for sharing. In case you wanna try them wholewheat: I changed 1 cup of the regular flour for 1.5 cups of whole-wheat flour and instead of regular buttermilk I used almond milk+1tbsp of lemon. They were still really good. Thanks for sharing how you made the recipe your own! So glad it turned out wonderfully! These biscuits are AMAZING. I teach a Foods 1 class in high school and I decided to use your recipe for rolled biscuits in our quick breads lab. The recipe I have used before was alright, but nothing special. Your biscuit recipe was “on point” as my high school students would say. They were so proud of themselves and took pictures and sent snapchats and made crazy sounds as they ate them. 60 students all gave your recipe 2 thumbs up! Thank you so much for posting this – I will be back to your site for more recipes. They will be visiting your site tomorrow for their Lab Write up! Your comment has totally made my day! I’m SO thrilled that your students enjoyed the biscuits so much! Thanks for your support! I hope you find more recipes that would work well in your classroom! If you freeze them before you bake them I’m sure they would be just fine. They may take 5 minutes longer to bake when you put them in the oven straight from the freezer. Just keep an eye on them. 🙂 Glad you like them so much Mandi! never made biscuits before and i am gong to use this recipe for christmas brunch! question, do i use salted or unsalted butter? does it matter? It doesn’t matter. Personal preference. Enjoy! I used salted and they were delicious. Can you freeze after baking? I haven’t tried it, but I think others have with success. Ok to double the recipe or do you suggest 2 batches? Made these for Christmas breakfast and they were amazing! Thanks for sharing!! I’m so glad you enjoyed them Mary! Thanks for your review! Is it 1 tbsp of double action baking powder ? Just made these and they are fantastic! Thanks so much for the recipe and the tips. This will be the only biscuit recipe I use from now on!! Aw! I’m so glad you like it Carol! I’ve used this recipe twice and it’s a hit with the family. Thanks! That’s so great! Thanks for your review Steph! As a southerner my Mom always told me to buy White Lily self-rising flour. I’ve always used shortening too. Can’t wait to try this recipe with butter and layering it. Hi Kathy! I bet you make a wonderful biscuit, if you’re from the south. I hope you like these too! Are you sure the measurements are correct or did I do something wrong? I followed your directions and my biscuits are sort of flat and some of the butter melted on the bottom of the pan under the buscuits. Other receipes use 6 TBL butter and that seems like it might be better vs your 1/2 cup. What did I do wrong???? 1/2 cup butter is 8 Tablespoons, so only 2 more Tablespoons than the 6 Tablespoons you are seeing in other recipes. You could try using only 6 Tbsp of butter if you want to, or try cutting the butter into slightly smaller pieces. You don’t want them too fine or you will get crumbly biscuits though. I’m guessing the pieces were kind of big or not cold enough if they melted on the bottom of the biscuits. I hope you can get it to work for you, there are many who have had great success with this recipe. Good luck! Thank you so much…I may try again!! I moved to Germany two years ago, and while they have a huge assortment of delicious homemade breads here, biscuits are hard to come by! So… I really hate baking, but when I had a biscuit craving, I had no choice. I tried many recipes which ranged from being bland and totally tasteless to “just okay.” Then I found this. WOW! These biscuits are buttery, a little sweet, crunchy on the outside, and soft on the inside. They are not only the best I’ve ever personally made, but… dare I say it?… they’re best biscuits I’ve ever eaten! I make a triple batch and freeze them. They take only a few extra minutes to bake after being frozen, and they’re still just as delicious. Thank you so much for this recipe! What great news! I’m so happy you enjoy this recipe so much Sheri! Thanks for your coming back to share your experience! Preheat and bake at 232 degrees celcius. Check after 10 minutes. Thank u Amber.. I have already made these biscuits.. it turned out awesome.. bookfold method i learnt from Vahchef, but ur tips are really awesome.. using curd and using chilled dough chilled butter really helped to make delicious cookies..Hats off.. Thank you.. Thanks for your feedback Mercy! Hello Amber: I made the recipe but they were not so soft and fluffy as they are in the recipe, I think I miss you egg to the recipe… I confirm please? Hello Maribel! So nice to hear from you! There is no egg in this recipe. The only thing I can think of is the flour was measured wrong or the altitude difference effected the recipe. Try 2 Tablespoons less butter (so only 6 Tablespoons or 85 grams – I hope I did the conversion right) and weigh your flour. 2 cups is 260 grams. I hope this helps! I just made these this morning. I was out of buttermilk and lemon juice, so I used Bragg’s Apple Cider Vinegar instead. I used my food processor because I do not have a cutter. I made sure I didn’t overwork the dough. They turned out great, very tender. Thank you for the wonderful recipe. That’s good to know! Thanks for sharing your review Lorie. So glad they turned out well for you! That is wonderful news! Thanks for your comment Moraima! I’m glad to hear this recipe works in Venezuela too! These sound very like scones to my English ears – Biscuits to us are crisp and dry and flat – the total opposite to yours! I would love to try chaffing – the folding method – even though we were always taught to use the gentlest, quickest touch, with cool hands, raising the mix high above the bowl during rubbing-in the butter to incorporate more air. Eggs are often added, and sugar for sweet ones. Also the scone-cutter is dipped in flour before each cut to stop it sticking and pulling. It is very interesting to see that cooling them for an hour will make them fluffier: this is definitely worth a try instead of just leaving them a few minutes while the raising agents get to work. A couple of queries: is the All-purpose flour, flour with no raising agent added? Here we call flour with no added raising agent, Plain Flour. If it has added raising agent, it is called Self Raising Flour. Is Baking Soda, Bicarbonate of Soda? You very kindly give a weight for the flour, could you possibly do the same for the butter? Also, the buttermilk: what would that be in Litres? I love to hear how others bake. So fun! As for your questions, I used all-purpose (plain) flour. Baking soda and bicarbonate of soda are indeed the same thing. 2 cups of flour is 480 grams. 1/2 cup of butter is 115 grams. 3/4 cup buttermilk is 180 grams or 0.18 litres. I find google very useful to help with conversions. 🙂 Good luck! Thank you so much – will now go off and have a try! Why are you even talking Baking Soda – your recipe calls for Baking Powder – right? My bad! I answer a lot of comments/questions from the back end without pulling up my recipe. So Jenni, if you want to try 3/4 tsp (5-6 grams) of baking soda (bicarbonate of soda) PLUS 1 1/2 tsp (5 grams) of cream of tartar, that would be best. Baking soda is same as Bicarbonate of soda BUT recipe calls for baking powder which is not the same. Baking powder s baking soda plus an agent that reacts with it to make the dough rise. Amber – I made em today. Looking “pretty” good but….. the whole story is that the first 6 seem perfect, the next 4-5 less so. Now here’s my question. In you text above, you write “Using a 2 1/4 or 2 1/2-inch biscuit cutter, cut 9 (maybe 10) biscuits “, but looking at the photo there, I can see you’re not going to get 9-10 out of that first 6″x9” slab. I didn’t either. I got 6. So I then grabbed remaining dough, baleed up, and rolled out and the got 3 – repeat and got 1 plus scraps to hand shape. Sure enough, the first 6 are perfect, then next group of 3 less, and then last 1 and scrap even less. So…can you clarify how you can result in 9-10 or more of the same tall fluffy result? Sorry for not clarifying that well enough. When I put my scraps together, I never ball it up. I push them together and pinch the seams OR stack the scraps gently and re-roll them out (like the original method). But no matter what, they just aren’t going to be as perfect as those first six. If you want more perfect looking biscuits, you might want to double the recipe. OK! That makes sense. So – just to be clear too – you can’t get 9-10 out of the first stack – right? Right. You get 6 the first time. Then the other 3-4 after carefully piecing/stacking together the scraps. Thanks for following along! The video ads help keep my recipes free for everyone. If you drag the volume button down, it will stay down every time you return to my site. Thanks for your support! Turned out great! Love the stacking method…I’ll be doing that from now on! That’s wonderful news Lindsay! Thanks for your comment! Glad it worked out for you! Hi Amber, which pastry rolling pin are you using! looks very nifty and ive been trying for find a similar two ended one but have come up empty! These are the best biscuits I ever made,only did two layers. PERFECT!!!! Hi Sandy! I’m so glad to hear that you enjoyed this recipe! Thanks for your comment! Hi – Is fat free milk ok to use? You can use fat free, but it might not be as moist as say 2% or whole milk. Have you ever made Buttermilk with just milk and vinegar. I live in a rural mountain area. I guess it doesn’t hurt to try. Thank you! Yes, milk and vinegar works great for buttermilk too! Go for it! Making them right now. It’s in the oven. Amber, I have made your biscuit recipe several times. Never a disappointment!!! Looking forward to trying more of your recipes. Thanks!!! Awesome! Thanks for your feedback Tina! Can I use bread flour. To make biscuits. You can, but bread flour has more gluten which makes bread chewy and elastic. That isn’t necessarily a good thing for flaky biscuits, so just be sure not to knead it too much. Just baked these biscuits and I love the layering of the cut pieces. Great trick! This is my first time baking biscuits and I wanted to use this recipe b/c it is “foolproof”. They tasted good but dry, is there a trick to ensure moist biscuits? Also, do you use salted or unsalted butter? You may have used too much flour while rolling and shaping the biscuits. Try using as little flour as possible. You want it lightly sticky still. As for the butter, you can use either. I prefer salted just because I like the extra salt, but it’s a personal preference. I hope this helps! Easy and tasted great! I just cut them in squares so I didn’t have to re-roll anything. Thanks! I like that idea! Thanks for your comment Mandy! Hi! Is there any chance the amount of milk in your recipe is wrong? 3/4 of a cup didn’t even come close to making the dough come together. I had to add an extra cup of buttermilk! Also in your video there seems to be more than 3/4 cup? Thanks! Well now I feel dumb. Just realized I was reading my measuring cup wrong. Never mind! No worries! I hope it worked out for you! You can use either salted or unsalted. Depending on your personal preference. You can also adjust the amount of salt if needed too. 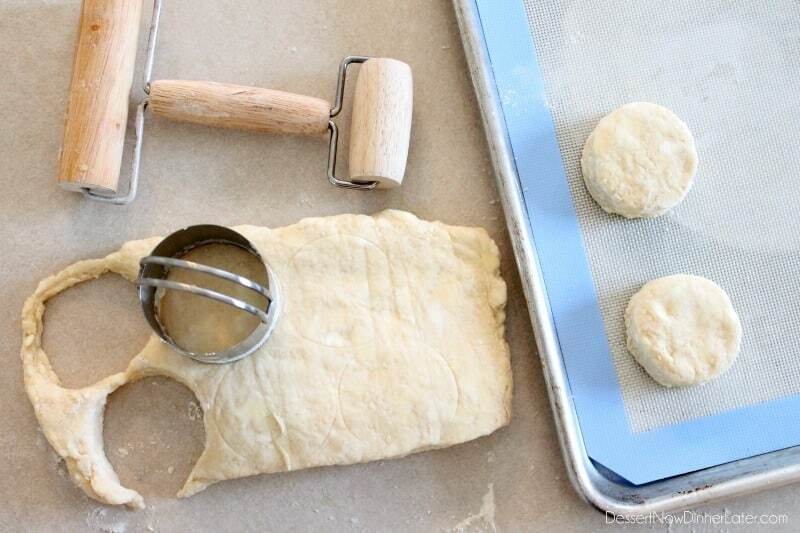 Nothing better than hot homemade biscuits. And this recipe makes delicious biscuits. I noticed one of your readers does the same as I do – grating frozen butter. I keep a few sticks of butter in my freezer and grate them as needed. I find the butter incorporates better with the flour with much less handling as to not warm the butter. Thanks for sharing your delicious recipes. I still need to try that. Thanks for the reminder! Leftovers are much better sliced in half and lightly toasted than nuked. First time making them and great results!! Easy and flaky. I added some honey to my buttermilk since I usually dont like biscuit taste. But they were awesome! Specially with jam! Thank you! Love honey! Glad you enjoyed this recipe! Holy cow! I finally made a biscuit that wasn’t a hockey puck! I am so excited and pleased….and these were soooo easy! Great news! I’m happy for you! As a man learning to bake, I tried your recipe. Worked out fantastic. I just used my fingers to incorporate the cold butter with flour and patted out. No fancy equipment required! Great recipe that I will definitely use many times. Man-tested and approved! I love this so much! Thanks for your comment Terry! I want to thank you for your awesome recipe. Our family is dairy-free, so I substituted Silk original soy milk for the milk, and Earth Balance vegan cooking sticks for the butter. They turned out beautifully! (We’ve been trying our substitutions in lots of other biscuit recipes for a long time, with not good results.) Yours is our new family recipe. Thanks! That’s great news Bonnie! Thanks for your comment. I’m so happy you were able to make it work for your dietary needs! I tried these for the first time this morning and loved them. In fact, I had another with lunch! Much better than my usual, go-to Gold Medal recipe. Wonderful! Thanks for your review Connie! I was looking to expand on my earlier comment but I couldn’t find it because this recipe is so incredible that there are dozens or comments to look through so I’m leaving a second one. ( yup that’s how fabulous it is!) 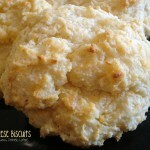 This is by far the best biscuit recipe I’ve ever made, my entire family and friends love them too. I can’t thank you enough for sharing this awesome recipe, i will definitely be making these over and over, as a matter of fact it’s 1 a.m. and yes I’m getting up to make a batch. This is the best! I’m so happy you are enjoying this recipe Ruth! This is the first recipe I have made from this blog and it was amazing! They were so good I immediately made another batch (literally, 5 minutes after taking the first batch out of the oven). I didn’t have a biscuit cutter so I just cut the dough into squares and they were great. I’m so glad you are enjoying this recipe so much Alison! Can I make these without buttermilk? Also, can I make them the night before and cook them the next morning? Hi Linda! You can use regular milk, or milk mixed with 1 tsp of white vinegar or lemon juice if you don’t have buttermilk and still want that tang. The acid also reacts with the baking powder for a fluffier biscuit. 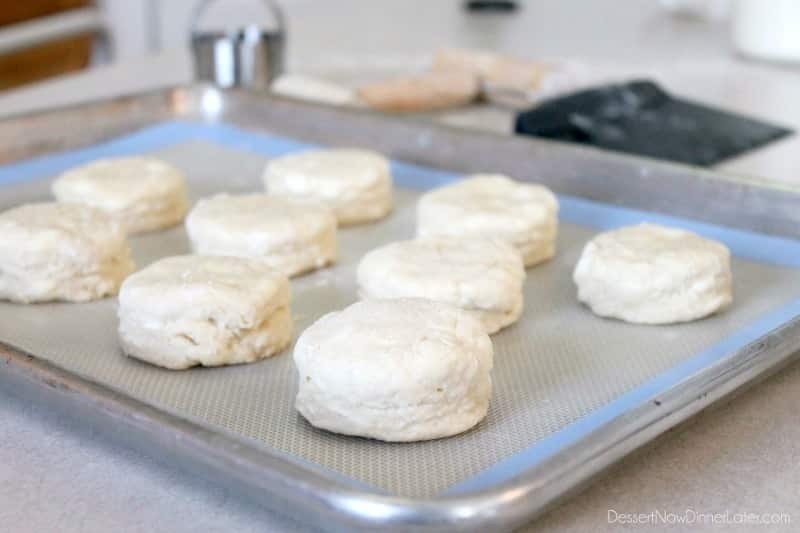 As far as making them ahead, I would either freeze the biscuits and bake them straight from the freezer, or bake them and reheat them the next day (350˚F for 6-8 minutes to reheat.) The baking powder loses it’s leavening action a few hours after being mixed. Refrigeration isn’t ideal. Delicious and easy! 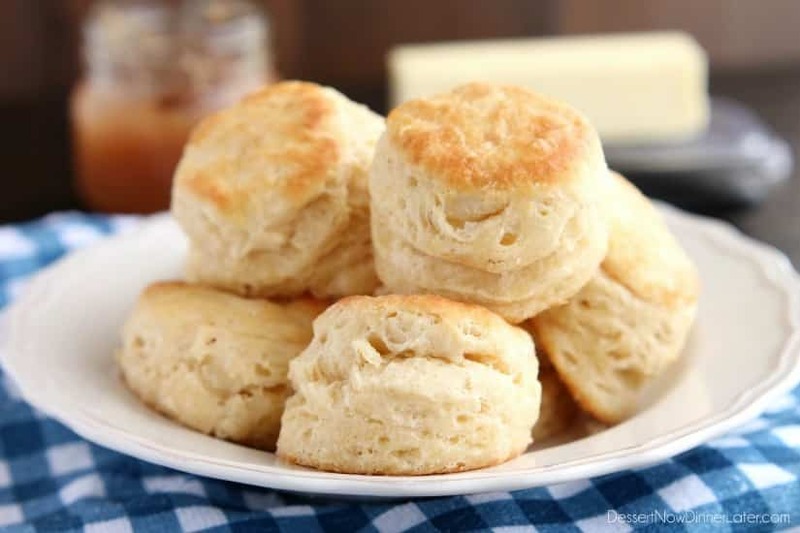 This is now my favorite go-to biscuit recipe. Thanks for sharing! Didn’t stack layers, but they are nice and fluffy. Shopping day today, so I’m low on everything… no milk, so I used sour cream…perfect! That’s great to know! Thanks for sharing your experience! New to biscuit making. These were so easy and tasted so delicious! I don’t plan to look any further for any new recipes for biscuits. Thank you! Aw yay! So glad you’re enjoying this recipe! 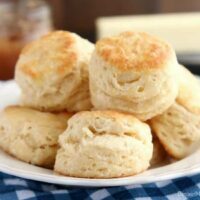 Was looking for a flaky biscuit recipe, and these fit the bill perfectly! I didn’t have buttermilk but I had powdered goat milk which I reconstituted and added the lemon juice. I also used sprouted spelt flour instead of wheat. The foldover was the charm! They came out flaky, with just the right amount of crunch to make the perfect bacon and egg sandwiches! A major crowd pleaser! Thank you so much for this! That’s so great! Thanks for sharing your experience! My 9 year old son baked these biscuits today with a little supervision from me, and they came out amazing! Thanks for the great recipe and clear instructions. The photos at each step are SO helpful! We can’t wait to try more recipes from your site. Up next is pumpkin chocolate chip bread! That’s so great! I love that your son is in the kitchen baking at a young age! Hope you enjoy the pumpkin chocolate chip bread too! Thanks for your comment. Outstanding recipe, I used the milk and lemon juice as I didn’t have buttermilk, biscuits were flaky and just a little crispy on outside 10/10 will make again. Thanks. So glad you enjoyed this recipe! Thanks for your comment! Hi I just wanted to give you 2 tips I use…i always put my flour & butter mixture in the freezer for just a couple minutes after I’ve stirred/whisked in my grated butter (I always use grated frozen butter) so that any stirring/whisking I did to incorporate it didn’t warm up those small pieces of butter too much then I take it out and add the ice cold buttermilk. I also take about 2 tbsp grated butter that’s frozen & as I’m folding to create the layers (I’m going to try the stacking!) I sprinkle some of the grated butter into the layers! 2019 and i just used this recipe again, your instructions are so clear and you dont ramble on and on about the look of the biscuits before getting into how to make them like other sites. your simple and to the point and pictures are wonderful once i begin cooking i start to doubt myself sometimes, Thank you for a great platform to get the recipe from, and the biscuits are delicious. i used them for breakfast and dinner. So glad you are enjoying this recipe! Thanks for your comment Amy! Yes that recipe is awesome! But it’s a heavy sausage ratio. I use half the sausage in that and we like that better. I just made these and can’t wait to taste them! They have a good bake but for some reason they didn’t rise very much. Any ideas?????? Really? You used baking powder, not baking soda right? If you are very high altitude, you could try decreasing the amount of baking powder by 3/4 tsp and increasing the temperature 25 degrees Fahrenheit, but I’m high altitude (4500′) and haven’t had any problems. Just thought of something else. 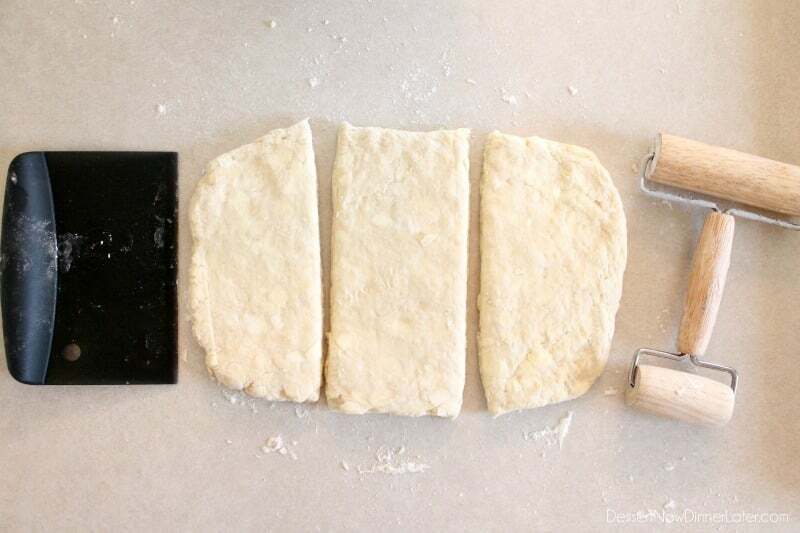 You want the dough about 1 1/2-inches tall when you cut them into circles. So kind of thicker. Amber..can I make these in the morning and bake them for dinner? Cover them in the fridge with a pastry cloth all day? They might not rise as well, but you can give it a try. Amber I notice some of the comments to freezing the dough my question is it okay to make the day before and storing in the refrigerator. I want to make some for my co-workers but trying to make the ahead of time and in the morning bake the biscuits. You’ll lose a lot of the leavening power if you mix all of the ingredients together ahead of time. I would mix the dry ingredients, cut the butter into them, and then add the buttermilk right before you want to shape and bake them. They are pretty quick to throw together. 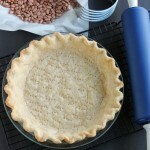 Good Morning I live in Canada was raised in the Deep South in Georgia I’m wondering if this will work with plain flour salt and baking power we don’t have self rising flour in Alberta thanks! Yes, this recipe actually uses all-purpose (not self rising) flour. Everything you need is in the printable recipe card. Enjoy!